Over the past few weeks we've had a chance to test out the blazingly fast new Dymo LabelWriter 450 Twin Turbo. This compact stylish label maker is simply put one of the fastest easiest label printers I've ever had the chance to use. Featuring dual print heads for multiple label styles and printing up to 71 labels per minute this little print is perfect for the mass mailer, eBay power seller or just about anyone that needs to pump out the labels quickly and efficiently. Features DYMO Stamps service provided by Endicia, a licensed USPS PC Postage provider. Connecting our LabelWriter 450 Twin Turbo was a breeze and took less than 3 mins from start to finish. Simply install the DYMO software, plug in the 450 TT and you should be up and printing in no time. The printer comes with two test rolls of labels, one for address and one for stamps and since the 450 TT auto senses the labels when you slide them up to the print head its almost fool proof. I did have an issue with the first set of labels jamming up, however it was my error for not having them justified correctly. One touch I really liked was the in-line transformer for the power cord. Almost everything these days uses a transformer that takes up too much plug space. But out 450 TT moves the transformer down the cord allowing for extra plug space on my surge protector. The DYMO Label version 8 software sets up very nicely. The layout is nicely organized with everything you need well placed. You can setup the program to print just about anything from one of labels to bar codes or you can print labels directly from your favorite programs – no retyping or program switching required! Print from within Microsoft Word, Excel, or Outlook, QuickBooks, or CardScan – just select the text and click an icon. The built in address book and auto address correction make it quick and easy to print out a full mailing list. A handy feature for sending invites to friends and family or for the home worker that has a block list of addresses to mail to. I didn't have the chance to try the DYMO Stamps service, but looking at the introduction video it looks like its as simple and efficient to use as the rest of the included software. Since there is no monthly fee and you only pay as you go there really is no reason not to try it out, I simply didn't have the time nor did I have anything that needed shipping over the course of our trial. 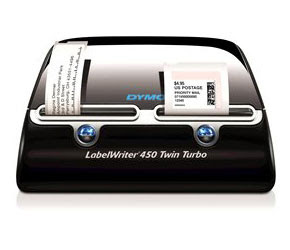 For someone that needs a great looking, compact label maker the DYMO LabelWriter 450 Twin Turbo would be a great choice. The MSRP of $210 might seem a little pricey at first, however once you see how much time you can save with the speed and efficiency of this little machine you'll quickly see that its well worth the cost.